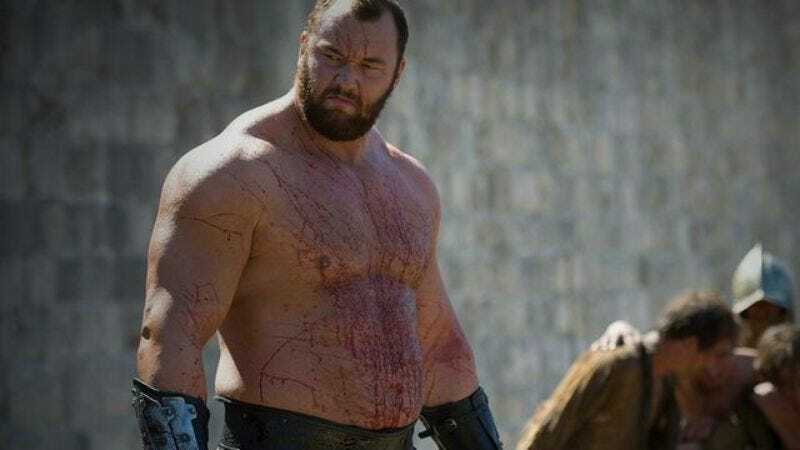 Actor, weightlifter, and king of the stones Hafþór Júlíus Björnsson, best known to Western audiences as Gregor “The Mountain” Clegane on HBO’s Game Of Thrones, has shattered yet another record in his terrifying quest to become the Earth’s strongest man. But unlike the rest, this record was 1,000 years old. While competing at the World’s Strongest Viking competition (Norway’s stop on the qualifying tour to compete for the title of World’s Strongest Man), Björnsson broke through a record once described in ancient Icelandic sagas. According to Strongman Champion League promoter Ilkka Kinnunen, the feat, in which a participant must walk while carrying a massive, 1,250 pound log on their back, was once attempted by the legendary Icelander Ormur Stórólfsson, to middling-positive results. Stórólfsson did manage to carry the log for three steps, but then, according to Kinnunen, “His back broke under the enormous pressure, and he was never the same after that.”One can imagine. At this year’s competition, though, Björnsson, undeterred by little things like a shattered spine, carried the log for five steps, easily breaking the millennium-old record. He also seemed to be exactly the same after that, going on to win the entire competition for the second year in a row and bellowing “NOTHING CAN STOP ME! NOTHING CAN BREAK ME!” to an adoring crowd. It all seems to be part of the actor’s ongoing effort to move “crushing a man’s head like an overripe melon” further and further down the list of the most terrifying things Hafþór Júlíus Björnsson has ever done.